Diverticulosis and diverticulitis are conditions that are more prevalent as age progresses. Both men and women suffer from these two conditions. 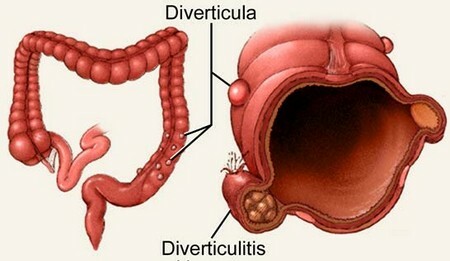 Diverticulosis is the condition in which pockets form in the intestines. Diverticulitis is when those pockets become swollen and inflamed. Diverticulitis in some people may cause abdominal pain and other very uncomfortable symptoms. Every patient may not experience the same symptoms or same levels of pain. Symptoms may vary from patient to patient. Many sufferers want to know how they can manage the pain that comes along with this disease. There are a few things tat are available for everyone to try. There are many options one can attempt to help manage the pain caused by diverticulitis. Here’s how you can manage your own pain. Increase your fiber intake. The more fiber in your diet, the more easy it becomes to eliminate waste. Digestion is eased by fiber and bowel movements are gentler when fiber is good in the diet. This in turn makes it easy on the inflamed intestines. The recommended daily does of fiber is 35-50 grams. Foods like whole grain breads and cereals are excellent for diverticulitis. You will need to make sure this fits your personal needs. Consult with your health care provider to see if a fiber supplement is best for you. If you are having very severe symptoms, you always want to consult your doctor. Depending on your personal symptoms, you may need to be diagnosed before taking medication even over the counter. Make sure there is no infection that needs to be treated. Prescribed medication or over the counter medication can be used. Take extra precaution when using any. They need not cause constipation in you. This only worsens symptoms. Get more exercise. You need to get some form of exercise every day. Regular exercise helps the digestive system to work more efficiently. It is recommended that every get at least 30 minutes of exercise everyday. This helps the body to eliminate waste. Increase your water intake. Water can help flush waste from the body. It also makes waste soft and this relieves the hardship off of the intestines. You also need to take care to replace any fluid you lost during exercise to keep the body well hydrated. If any of the above suggestions do not bring you any relief then consider surgery. In the event that diverticulitis can not be soothed then surgery may be the only way to gain some relief from the symptoms. The surgery may drain excess fluid or restructure some of the bowel to lessen the pain and make elimination easier.